Want to feel healthier and improve your quality of life. Cal Spas Ultimate Fitness ™ may be perfect for you. With this swim spa, you can have the convenience of a complete aquatic gym in all in the convenience of your own backyard. Each unit comes with Cal Spas' Jet Stream Propulsion System. This unique system uses two jets to provide both a top and an undercurrent to help keep the swimmer positioned in the stream. The Jet Stream Propulsion System has been specially designed to benefit the full range of swim spa users from novice, to experienced treadmill swimmers, to seasoned athletes. Cal Spas distinguishes itself from its competitors with its thoughtful design of the swim spa features. To Cal Spas, it is not about more jets, seats or waterfalls, but about the best combination to provide the best experience. Cal Spas offers led lighting, easy-to-use covers, built-in stereos and other unique spa accessories. 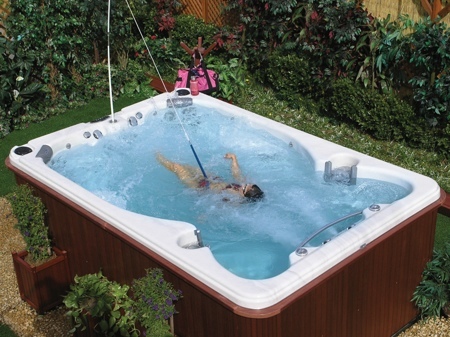 Cal Spas ® was founded in 1979 as a manufacturer of luxury hot tubs. Today they are known worldwide as the leading maker of home resort products. They offer seven types of swim spas for various fitness levels - from beginner to health enthusiast. A Cal Spa Swim Spa is a place to stay fit, laugh with friend and family and to create memories. Escape to a healthy, relaxing oasis of warm water. Cal Flex Fitness System - various bands and cords that provide adjustable resistance. The Cal Flex Fitness Package easily attaches to anchors built into the spa, to help anyone develop a fine-tuned physique. Music Options - iSound System (2 speaker system with iPod station) or Stereo with CD Player. Lighting Options - The Ultimate Fitness series has an exhaustive array of lighting options. All models come with standard Candy Cane Jets, which are are LED-ready for upgrade with Cal Spas' Hi-Light Jet Lighting. This optional lighting can be programmed to illuminate the tub with single colors or a variety of alternating hues. Also available is the option for exterior 'porch lights' to guide one's safe entrance. Upgraded Current - The Niagara Propulsion System is now offered as an upgrade for a more challenging workout.